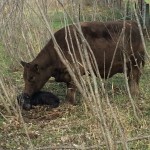 Pathfinders would like to announce the arrival of their first calves born at Tilbuster Station this weekend. Two bull calves, mums and bubs are doing well. Another 4 to hopefully arrive this week.